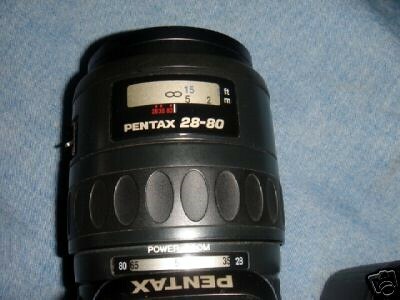 I have two copies of this lens and both missed the cover for the power zoom switch for A/AS specific function for power zoom. I kept one copy to myself after I tested the power zoom quite positively on my K100D body and Pentax pz-1 film body. It has rich color and contrast and I find the longer focal range more easy to use with less lens change as compared to Pentax DA 18-55 kit's lens. I did all the following test shots in San Francisco on 1st day of 2008. A bit bulky but definitely not heavy as it is all plastic. Power zoom ring works only in K10D body but not in K100D body but the zoom ring works in both as usual. Should be inexpensive to get, I will recommend this lens for under $50.00 as an alternative to kit's lens and it will work with both digital and film bodies. As far as I know, various power zoom features will not work on K100D. The power zoom ring (just the zooming part) won't even work on K100D but I heard that it works in K10D. But still, all the extra features that go with power zoom will not be functional in the latest dSLR. And I just use the lens like a regular zoom lens and by moving the power zoom ring to turn off power zoom, I could use the zoom ring as normal moving in the range of 28-80 mm. I will recommend this lens as a cheap alternative to the kit's lens. The noted caveats is that the build quality of the lens is quite poor with all plastic moldings. But pictures come out with good contrast and color. Sharpness is very reasonable to me when stopped down.